As I started a recent workshop on using solution-focused to solve complex problems, I overheard one of the participants say, “I don’t understand how asking a question can solve a problem.” Generally, when I hear a comment like that, I would choose to talk to the person explain to the group how questions do solve problems … But, that time I decided to keep quiet and continue with the workshop. Active Resistance: the other person finds an obvious way not to be cooperative. Passive Resistance: the other person finds a less obvious way, and may appear to be helpful, yet is still not being cooperative. Acceptance: the other person is OK with the change and supports the effort. All three happen, and the person may be resisting your idea because it is a bad idea. When resistance or acceptance occurs, keep vigilant and be skeptical of your choices. Often our initial thought is not the best or the most resilient, and just because someone agrees does not mean that you are right. How can questions solve problems? Within solution-focused we say that the question is the intervention and that my solution will not work for you; you need to develop what works best for you; this is how questions are helpful. In working through complex or obvious problems having a good question process will break stuckness, and increase your and other peoples acceptance of the progress steps. Often the approval rises, because the steps are what is already working well, and through a discussion with the other person progress clues are identified. “You accept and put greater effort into ideas that you develop; even if that idea fails you will make an effort to improve or find a new way because it was your idea. The image above and the questions below are an example of how the SOLVEDmethod from the SOLVEDcards works. Try it, think about a challenge you are having and do your best to respond to each of the questions. Situation: When you are making progress, where is your energy going? Observation: What does progress look like in the next 10 minutes? 10 days? 10 years? Level: Think about your challenge as a balancing act. What is currently keeping your progress in balance? What would it look like when your progress is off balance? Validation: What have you accomplished that makes you proud? Exception: The solution is water, and the challenge is the pipe that water flows through. Describe the path of least resistance for the water. Decision and Direction: What did you experience or observe from today that you know will be helpful in the future? What is working that you can do more of. What is not working that you can do less of. How you created your current success and progress. What small next step you will make. 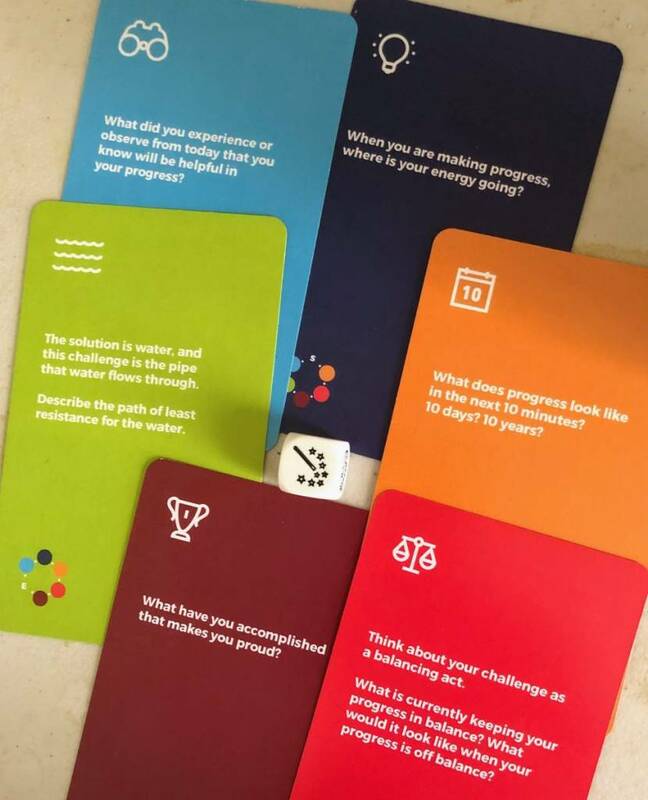 Through your skills and thinking, you can make progress on complex problems, and as you continue to use the SOLVEDcards, you will make more and more progress.